We offer three types of picture hanging wire: traditional braided picture wire, stainless steel picture wire and vinyl coated stainless steel wire. Braided picture wire is made from braided (interwoven) strands of thin galvanized steel wire. This process makes the finished product strong, in terms of its breaking strength, yet flexible. With braided picture wire, the diameter of the thin wire used for the individual strands is the same regardless of the size of the finished wire. 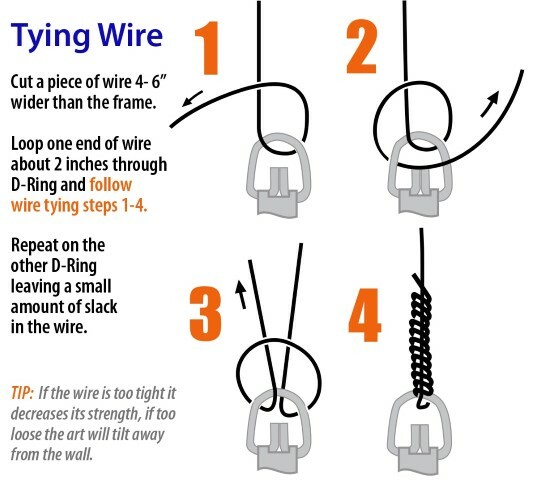 Consequently as braided wire sizes get larger, there are more individual strands in the finished wire. For example #2 wire contains twelve individual strands, #8 wire contains thirty-six individual strands. Each successive wire size is heavier, larger in diameter and stronger. Stainless steel picture wire is made differently. It consists of seven individual strands of stainless steel wire that have been twisted under tension--like a cable--rather than braided. This design makes stainless steel wire comparatively stronger than braided wire, but at the expense of some flexibility in the larger sizes. Vinyl coated wire is stainless steel wire, but with a soft, flexible protective vinyl coating which makes it softer to the touch and easy on your fingers. Since it is stainless steel wire under the vinyl coating, you still have a very strong high strength wire. #2 .040" 12 lb. #3 .028" 25 lb. #3 .050" 16 lb. #5 .035" 40 lb. #4 .060" 20 lb. #8 .045" 60 lb. #6 .080" 28 lb. #9 .060" 100 lb.